Are people intrinsically religious? Can we be both religious and spiritual at the same time? Does religion work against being genuinely spiritual? 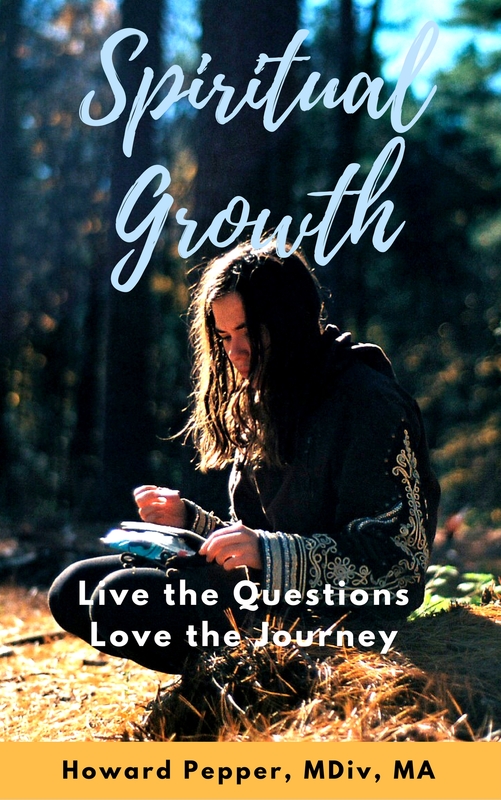 These are some of the questions that Spiritual Growth: Live the Questions, Love the Answers poses and begins to answer. But as the title suggests, these questions and many others about God, our purpose in this life and what lies beyond are not readily answered, wrapped in tidy packages. Rather, we live with them throughout life’s journey. As we move from one stage of growth to another, the questions change. We learn to pose deeper ones if we consciously live out our innate drive to grow throughout life. We learn to love more deeply and broadly as well. But this is not automatic. It depends on our responses to the influences in our lives. Most Americans have been influenced to one extent or another by Christianity. Depending on factors such as our specific religious tradition, life experiences and personality, we see different things in the life and teachings of Jesus. Do these differences mean someone is right and everyone else is wrong? The book’s contention is that religion typically has way too much mentality of “we are right and they are wrong” – a misguided emphasis on right beliefs about highly abstract, often controversial matters. What happened to doing what Jesus challenges us to do? Nearly everyone, including non-religious humanists, agrees on many of these ideals, but doing them is often not as easy as is arguing over theology. With this said, Spiritual Growth: Live the Questions, Love the Answers wades into theological waters just a bit. The reason: How we conceive of God and God’s interaction with the world and with us is indeed important. Not only are personal peace and the ability to contribute to humanity at stake but also things like serious conflicts between certain institutions and thought leaders of religion and of science. There is a war going on which need not be fought. It is the conflict between the God of traditional Christian thought and the theoretical/factual assumptions of science. This is conceptual mortal combat. Young spiritual seekers are often the collateral damage. Supernaturalism is still dominant in religion. For over a century, pure naturalism has been dominant in science. So we have basic opposites in two of society’s most powerful institutions. It produces unsolvable stand-offs on issues that have massive practical effects. Politics and with it public and international policy are critical places the belief conflicts often housed in institutions of religion and science get expressed and affect us all. How did we get into such a stand-off and is there any possible resolution? The book gives a brief overview of science emerging from a Western worldview of nearly universal and traditional concepts of an all-powerful and controlling God (most early scientists were faithful church members). With this, it traces the major movements within Christian faith that sought to adjust to intellectual advancements in science and the humanities and the secularization of general culture. This builds to introducing possibilities for greater harmony and even active collaboration between science and Christian faith. The situation can be improved to everyone’s benefit! Along the way, tough issues individuals face are tackled: finding one’s place or gaining and keeping intellectual integrity in this often confusing belief-structure situation. Particularly in mind are college students and graduates of up to age 30 or 35. Their immediate and longer-range challenges are addressed along with important discoveries about stages of development and the tensions of transitioning from one to the next. Might it be important… can it prove workable… for youth to suspend any real commitment to a religious belief system generally until age 30 or older? Some stage concepts, such as the cognitive development stages of Piaget or the adult “life task” stages of Erikson are widely known of though little understood. Others, like the faith development stages of James Fowler or the gender-related nuances of Carol Gilligan on moral development, are little known. Even a general overview of them, as the book supplies along with the better-known theories, can be very helpful. A major contribution of the book is the guidance it provides young adults trying to form an intellectually sound basis for belief in some kind of a spiritual realm – one worth pursuing and seeking to understand. It offers some idea of how faith progresses for many people. But it goes beyond the basis for faith to the kind of faith that is robust – which not only respects but also seeks out the insights of scientific endeavor, knowing that the collaboration of science and spirit is the key to true advancement.